Can Facebook help get more people excited about Apple's Live Photos? Nearly four months after Apple (AAPL) announced the new moving image format, it will finally work on Facebook (FB). But there's a catch. They'll only be visible on Facebook's iOS app, and only by people running iOS 9 or later on their iPhone or iPad. A Live Photo is a combination still image and video shot on the iPhone 6S. When you press and hold on the image, it plays a three-second video that was automatically recorded at the same time. Live Photos were one of the most heavily hyped new features on the latest iPhones. As innovative as they are, they have been handicapped by only working on Apple gadgets. Only other Apple customers can enjoy them (though you can use a third-party app to make a GIF or just share them as normal images). The new Facebook integration won't be much help for people in mixed-OS families and friendships. Android customers or people accessing Facebook's website will see a regular old still photograph. 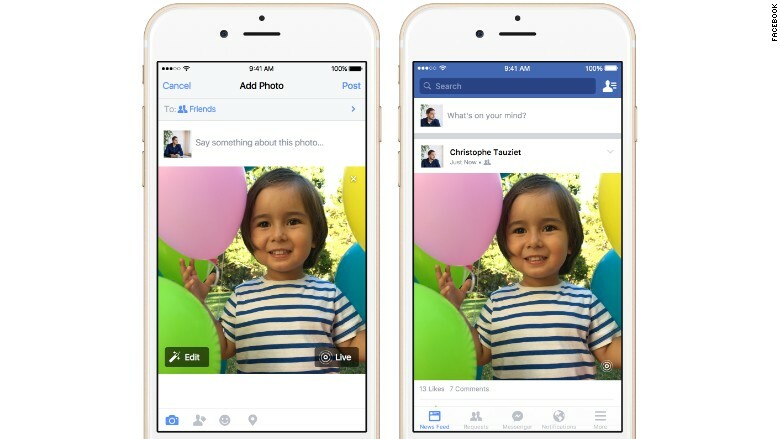 Facebook is the second service to add support for Live Photos. Tumblr started displaying them on its iOS app December 10. Getty Images plans on integrating Live Photos into its iOS app soon. Instagram would seem to be a natural fit for the images, but the Facebook-owned app hasn't shared any plans to add Live Photos. The iPhone 6S's other marquee feature has had more luck than Live Photos. 3D Touch is a pressure-sensitive touchscreen. The feature worked with most built-in Apple apps and a few third-party apps at launch. Over the past few months, more apps have started adding it like Twitter, Flickr, Swarm and Amazon. It's mostly handy for shortcut menus, but a few developers are getting creative. Flying game Breakneck uses pressure to navigate, and Johns Hopkins is working on a game that can help stroke victims improve dexterity. Soon, Apple's Garage Band will use 3D Touch to add additional sound effects based on pressure.